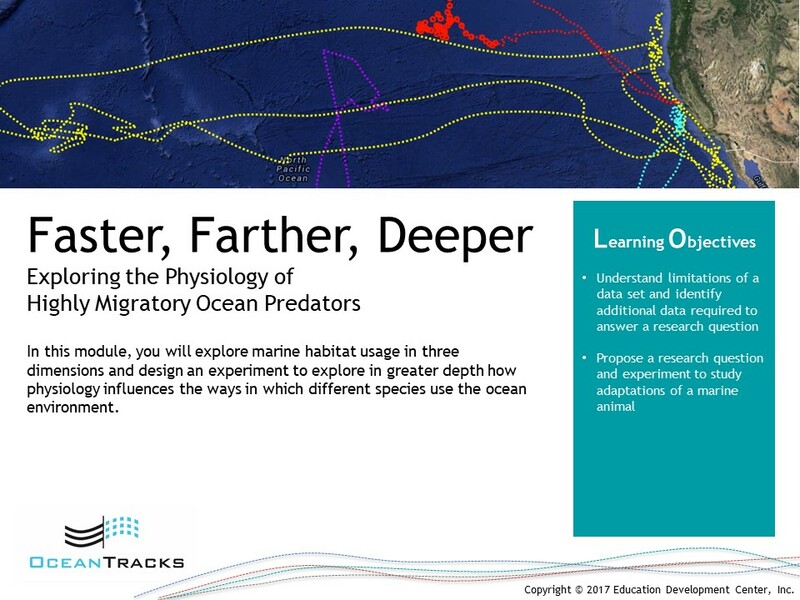 The modules below were developed to engage undergraduate students with authentic scientific data through investigations that mirror those currently being conducted by scientists studying the broad-scale effects of climate and human activities on top predators in ocean ecosystems. 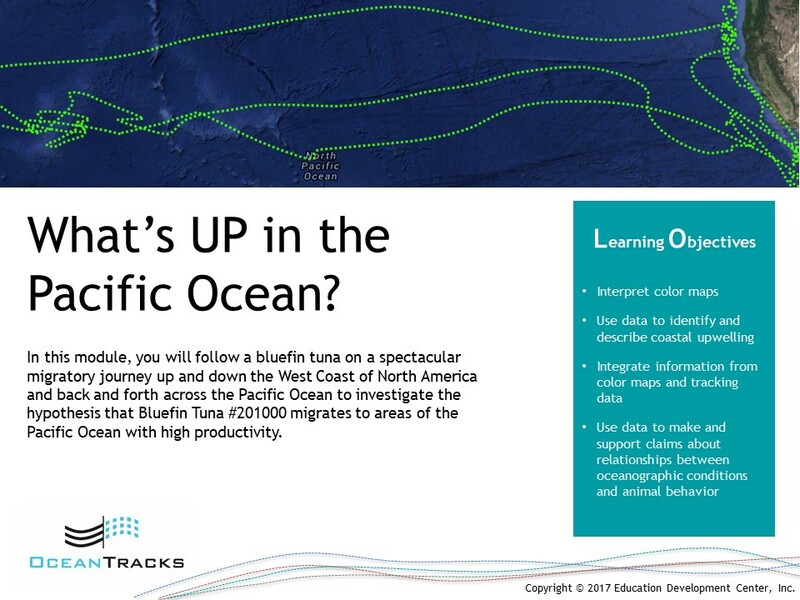 Using the Ocean Tracks interactive map and data analysis tools, students will explore and quantify patterns in the migratory tracks of marine animals in the northern Pacific Ocean and relate these behaviors to fluctuations and trends in physical oceanographic variables. 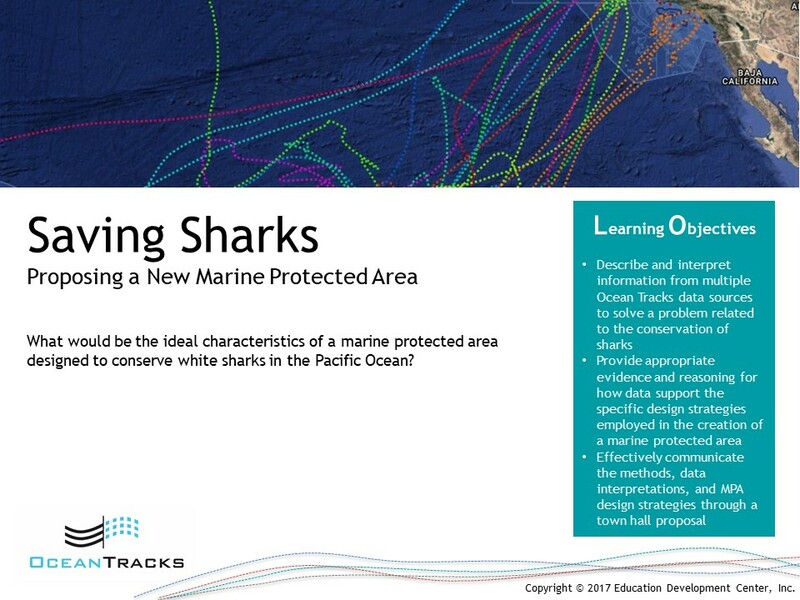 If you need to access a previous version of the learning modules, or have any other questions, please email the Ocean Tracks team. The tracking data in Ocean Tracks have been a powerful tool for scientists, revealing animal behaviors never before understood. You’ll use these data to develop your own new insights about these animals, but beware—to extract meaningful patterns and separate facts from artifacts, you need to take a critical look at the data. 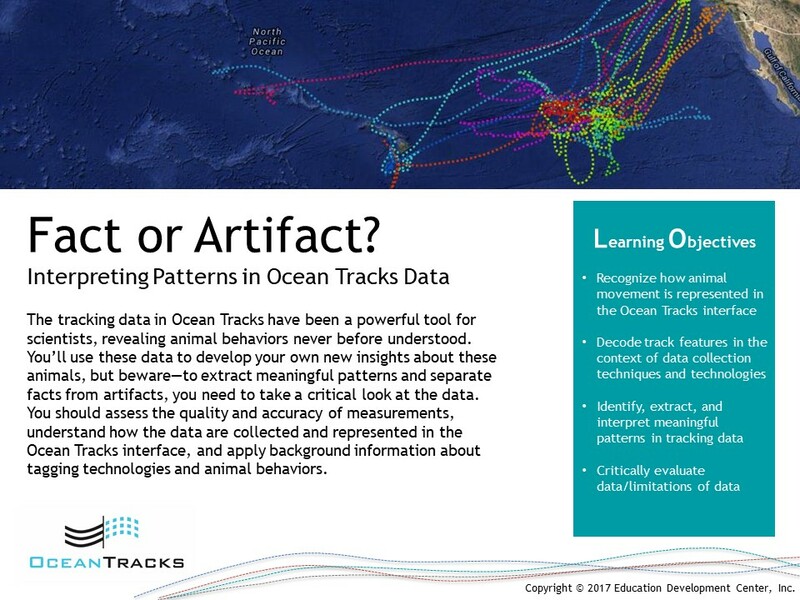 You should assess the quality and accuracy of measurements, understand how the data are collected and represented in the Ocean Tracks interface, and apply background information about tagging technologies and animal behaviors. In this module, you will follow a bluefin tuna on a spectacular migratory journey up and down the West Coast of North America and back and forth across the Pacific Ocean to investigate the hypothesis that Bluefin Tuna #201000 migrates to areas of the Pacific Ocean with high productivity. In this module, you will explore marine habitat usage in three dimensions and design an experiment to explore in greater depth how physiology influences the ways in which different species use the ocean environment. 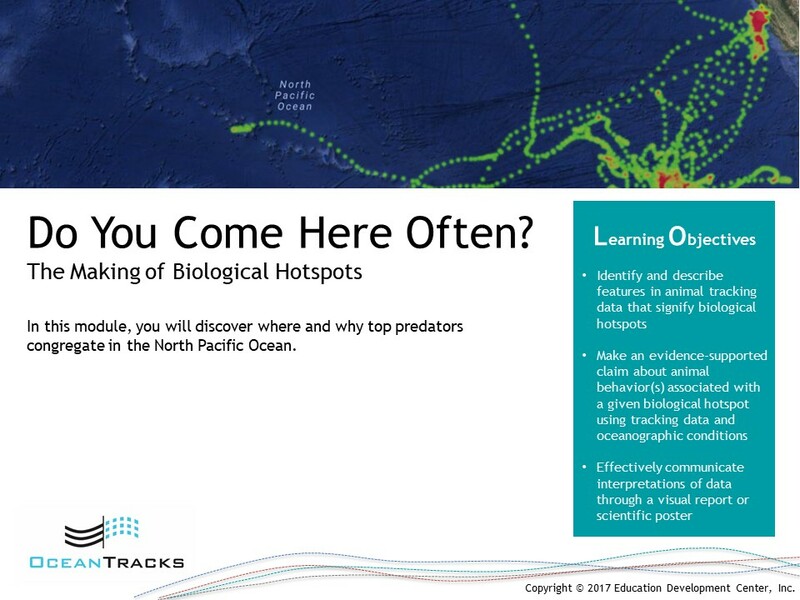 In this module, you will discover where and why top predators congregate in the North Pacific Ocean. 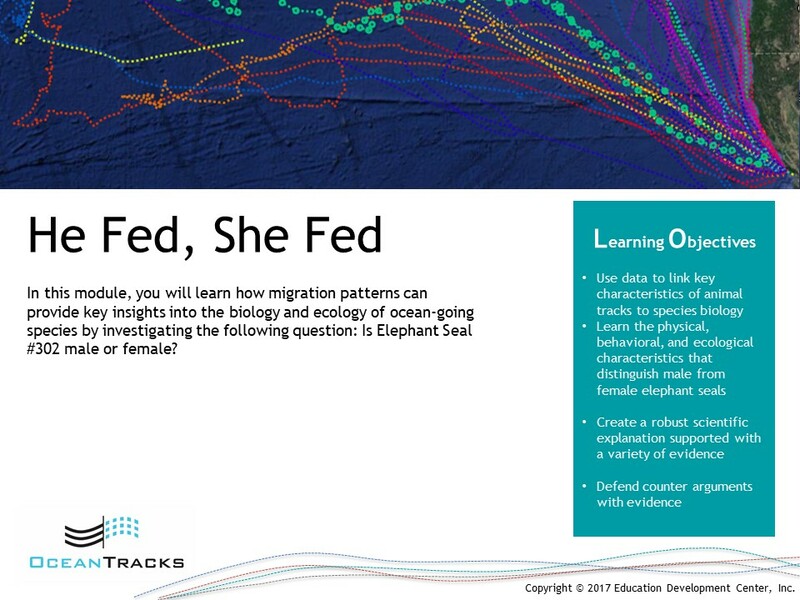 In this module, you will learn how migration patterns can provide key insights into the biology and ecology of ocean-going species by investigating the following question: Is Elephant Seal #302 male or female? What would be the ideal characteristics of a marine protected area designed to conserve white sharks in the Pacific Ocean?